This is a long post, but if your weather is set for all-day drizzle like it is here, you’ll have time to read it. I’m also sending a much shorter version to Mother Earth News, where I’m joining their Blog Squad. 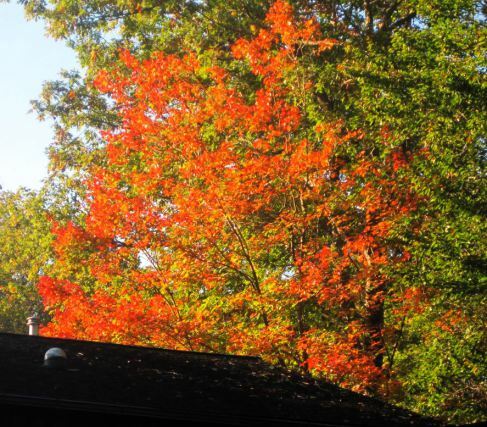 So if you are very short of time, you can look there in a few weeks. This season is becoming past-tense, and some of us are already starting to think about next year. 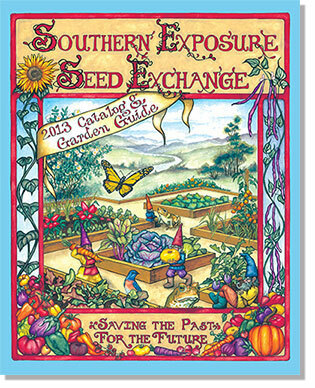 Seed companies are putting their catalogs together, and soon we’ll be snuggled beside our woodstoves perusing them, hoping to find varieties that will not repeat this year’s problems. Reading between the lines of the variety descriptions is a science and an art. How not to get carried away by all the positive exclamations and miss some basic fact that would tell you this variety is not for your farm? Which catalogs do you buy from? See the Safe Seed Pledge list for companies that do not knowingly buy, sell or trade genetically engineered seeds or plants. You may want to buy from local small seed companies who specialize in locally adapted varieties. Crops that overwinter in zone 7 could die in zone 5. “Adaptable” “easy to grow” are good phrases to look for. Naturally, your climate will affect what grows well. Here it’s too hot for us to grow runner beans, Brussels sprouts, or cauliflower. We don’t buy our okra seed from companies in the north – they are focused on varieties which will produce a decent crop in their climates. Our worries are different. “Requires an attentive grower” is a helpful warning. The size and skill of your labor force matter. Can you pick beans quickly enough to earn a decent living? “Best for organic production” means it doesn’t require lots of pesticides to keep it producing. What does your market want? Are they truly committed to heirlooms, or is flavor actually more important? Those are not the same thing! Some old varieties are rare for a reason! People didn’t like them much! Others are fantastic and easy to grow in quantity. Finding which are which is difficult. Heirloom tomatoes are a special challenge: which ones crack and split? The Heirloom Tomato: From Garden to Table: Recipes, Portraits, and History of the World’s Most Beautiful Fruit by Amy Goldman is not just a beautiful book, but a very useful one. The author spills the beans on which varieties are worth growing. She has books on squash and melons too, but I haven’t had the joy of reading those yet. Another reliable source on tomatoes is Craig LeHoullier. An early zucchini might be 47 days from direct sowing, but even the late Costata Romanesco is only 52 days. How important is it to have zucchini 5 days earlier? And after your first sowing, is it still as important to have a 47-day variety? Or could you choose a different one (with other good qualities) and simply sow it a day or two sooner? Raven zucchini has no listed disease-resistance, while Dunja withstands Powdery Mildew, Papaya Ringspot Virus (I had no idea. . .), Watermelon Mosaic Virus and Zucchini Mosaic Virus. Dunja has high yields of dark green zucchini, and so does Raven. Dunja has open plants and only small spines, so harvest is easy. Raven has open plants too. No mention of spines – are they wicked? Dunja is organically grown, Raven is not. How about price? Dunja costs twice as much as Raven! 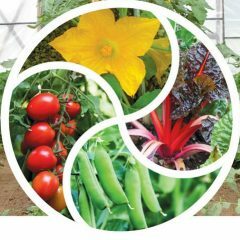 What price organic seed, disease-resistance and short spines? Spineless Perfection (45 days) and Tigress (50 days) offer the same disease-resistance package. Both are medium green, high yielding, cylindrical zucchini. Spineless Perfection has an open plant, Tigress is only semi-open, and makes no promises about lack of spines. Price is very similar. Risk the five-day delay, the spines and the only “semi-easy harvesting” to save a dollar on 1000 seeds? Good catalogs have a wealth of information about disease resistance or tolerance of their varieties. Do read their list of codes or abbreviations. (Admittedly the lists can sometimes be hard to find.) 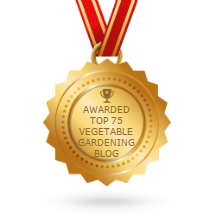 Don’t be a vegetable hypochondriac! Don’t let the length of the list scare you off – your plants won’t get everything listed. Johnny’s had 66 items in their Vegetable Disease Code list last time I counted. It really helps if you monitored your plants and know which diseases you are trying to avoid. We don’t worry about Pea Leaf Roll Virus or Enation Mosaic Virus of peas because our pea season is so short that the plants will be dead of heat stroke before they get sick with anything. 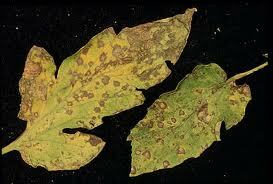 When I was new to Virginia it took me several years to realize our tomato leaf disease was Septoria Leaf Spot. I even bought Early Blight resistant tomato seed one year and was sorely disappointed at the spotty leaves they got. 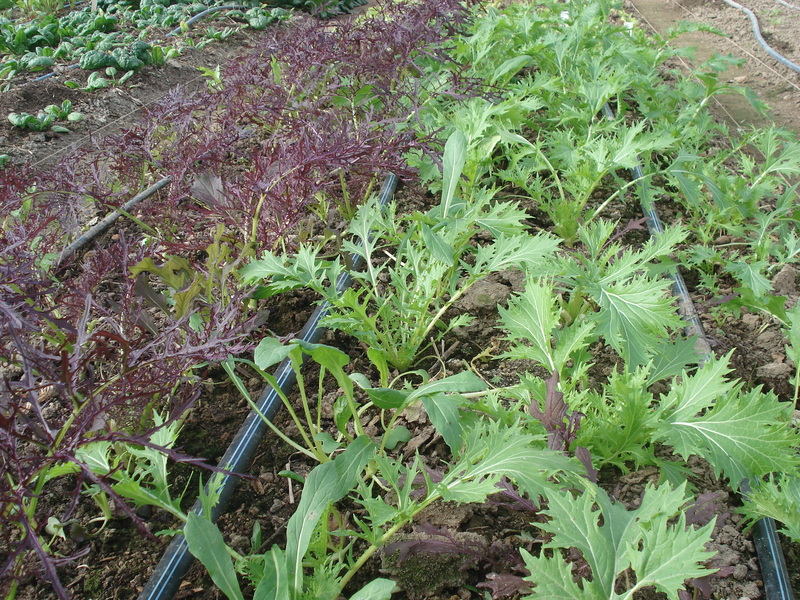 Beet greens resistant to cercospora will provide beautiful greens as well as roots. Early Wonder Tall Top is rated by Johnnys as the best beet for greens. Johnnys gives days-to-maturity from cool weather spring transplanting. They suggest adding 14 days from direct sowing (direct-sown crops suffer no transplanting shock, so grow faster overall, but you need to add in extra time from seeding to transplant size). Subtract 10-14 days for warm weather transplanting (as crops grow quicker then). Fedco lists days from direct seeding for many crops.They suggest subtracting 20 days from date of transplanting. With warm weather crops they list days from transplanting. For peppers the days listed are from transplanting to full-color maturity. Some catalogs list days to full-size green peppers only. “Early maturing” isn’t so useful if the seed rots in cold soil, so check for both pieces of info. Provider bean is cold-soil tolerant and fast-maturing. Take a steady look at packet size and seed specs (seeds/ounce or seeds/gram). Alas, this country has not yet fully metricated. Seeds are measured out in many ways. Go to www.metric-conversions.org/ and print yourself some conversion tables, or use the online calculators. Take a dark pen to your catalogs and write in the relevant numbers. For a particular crop is “mild” better than “rich” or “robust”, or not? There are mild-flavored Asian greens such as mizuna, available in green, red and purple, and there are spicy mustard greens that look very similar: Golden Frills, Ruby Streaks, Scarlet Frills, Red Splendor. Ruby Streaks beside green mizuna. Ruby Streaks is an exceptionally beautiful plant. We tend not to like spicy mustard greens, but cut small into a salad mix, we have no trouble enjoying it. “Compact”, “Mini” = small. Do your customers cook for just themselves? They’ll want mini. Are you supplying institutional kitchens? They’ll usually want full-size crops, unless they like “snack-size cucumbers” which they serve whole, with less work. If you want big cabbages, don’t buy from catalogs which have carefully chosen small to medium-sized heads because that’s what most people want these days. It can be hard to compare weights with measurements. Small = 2-4lbs, 4-6”. “Mini-broccolis” Santee, De Cicco won’t produce a big head, ever, just florets. Be sure your crew knows what size to pick. Mache (corn salad) is a very small vegetable, usually eaten when the whole plant is 3-4” across. Even if the variety description says “long leaves” it’s all relative – maybe they’ll be 4” rather than 3” if you let them really grow. At the other end of the Rampancy Rating are these key phrases: “needs room to roam,” “vigorous vines”: you can’t sell vines! Are they worth the space? Be sure you plant with appropriate spacing. “Needs sturdy trellis”: is it worth the time? “Will be bitter in hot weather.” “Prefers warm days and nights – expect reduced yields in cooler areas” – you have been warned! Remember to check this. It’s refreshing that some catalogs now are more upfront “Not heat-tolerant” says Fedco about Bush Blue Lake bean. If your spring heats up quickly, you’ll want greens that are bolt-resistant as well as cold-tolerant, so you can set them out early. Giant Viroflay spinach sure grows big leaves, but they don’t last long in our climate. Tyee is more bolt-resistant, much better for us. Big chicory, radicchio and endive leaves are going to be bitter if grown at the wrong time of year and not blanched. And sometimes even if you do: they are not uniform varieties. “Concentrated Fruit Set” versus “long harvest season”: length of harvest season is best viewed as potential rather than promised. If Mexican bean beetles or downy mildew are likely to take down your crops, you might do better to sow successions more frequently and not worry about long harvest periods. “Uniform maturity” is definitely a plus if you are growing a drying bean, popcorn, edamame or other single harvest crop. “Holds well in the field” is to your advantage if you hope to pick three times a week for a month. “Easiest for hand harvest” (E-Z Pick beans) means they come off the vine easily; but “better for hand harvest” can mean simply unsuitable for machine harvest (plants sprawl). “Intended to be picked very slender” means tough when big, so be sure you get a high enough price to justify the lower yield and extra harvest time. And be sure you can harvest every 36-48 hours, or you won’t have anything edible. Some broccoli has “good side-shoot production” (Gypsy, Amadeus, Belstar). If side-shoots aren’t mentioned, it’s likely that variety was bred for crown cuts. “Short-term storage only” – we usually read this as “not for storage.” Tendersweet is a fine cabbage for fresh use – its leaves are thin and sweet. Thin leaves dry out fast, so it’s not good for storage. “Retains flavor when frozen or canned” “Best for sauerkraut” “Good for kimchee” “Easy to shell” These phrases are music to the ears of gardeners putting up produce for winter. 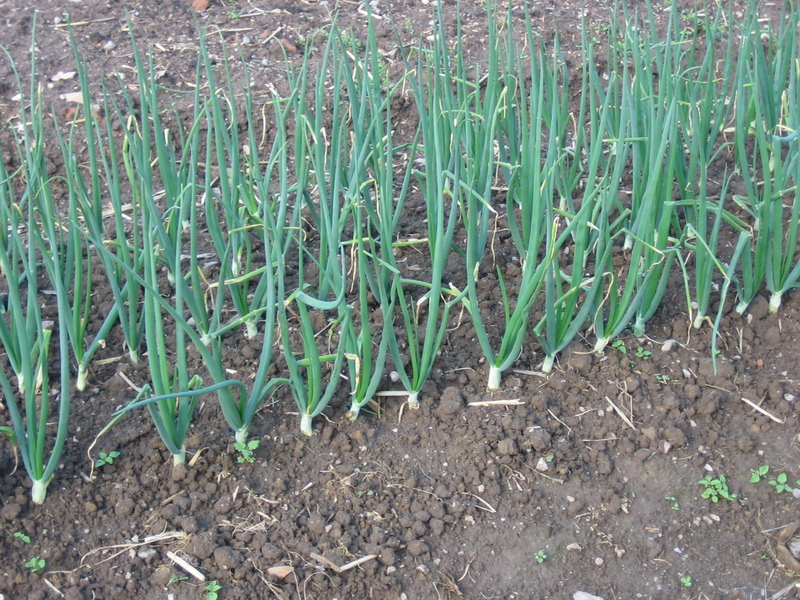 A bed of young onions. Latitude makes a difference with onions. Happily, more catalogs now state which latitudes each variety is adapted for. We’re at 38°N. No use us growing Red Bull (43°-65°), as the days never get long enough to initiate bulbing. Nor do we have much hope for Desert Sunrise (30°-36°) – because after the spring equinox, our hours of daylight are more than further south – they will start bulbing before having a chance to grow very big. A few small leaves cannot produce a big bulb. Some vegetables commonly thought of as winter squash are in catalogs as pumpkins. Many cans of pumpkin pie filling are not made from round orange-skinned pumpkins, but from squash. Choose squash varieties that grow well in your area and make all the pies you want. Or make no pies and serve the squash baked, or in soups. There are four types of squash: Pepo, the classic pumpkins, pattypans, acorn squash, delicata, dumplings, zucchini and summer squash; Moschata, the long-storing usually tan ones with hard five-sided stems, such as butternut, cheese pumpkins and Seminole squash; Maxima, the (often large) ones with fat round corky stems, such as hubbards, buttercups and bananas; and Mixta, less-common older Southern types like Cushaws. 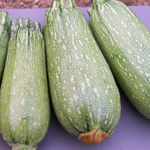 Research at Southern Exposure Seed Exchange this year showed that many Moschata squash varieties, the kind most resistant to bugs, are also tasty at the immature stage as “summer squash”. So ignore what you’re “supposed to do” and do what works! “Parthenocarpic” plants can set fruit without pollination, so good for hoophouse growing or production under rowcover or insect netting. Some new varieties of cucumbers and squash are parthenocarpic, and higher-priced, but some old favorites also happen to be parthenocarpic, Little Leaf pickling cucumber, for example. “Gynoecious” plants have only female flowers, so yield can be higher. These plants still require pollination to set fruit, unless they are also parthenocarpic, so some seeds of another (pollinizer) variety are included in the packet. You’ll need to grow some of these, even though they won’t themselves give you the fruit you want. Sometimes the pollinizer seeds are colored, so you can be sure to sow some. “Monogerm” beets produce only one seedling from each seedball/fruit. Others will need singling. Trade-off price versus time singling. Don’t plant any Super Sweet varieties unless you put them at least 100ft away from other kinds, or you make sure they don’t flower within 10 days of each other. Mistakes will lead to horrible starchy kernels in both plantings. Think about this also if you are growing popcorn, dent corn, flint corn. Those dry corns also need to be separated from all sweet corns. Ignore the small print on this at your peril. Super Sweet corns have other challenging features: the seed is smaller than normal corn, so your planter may need adjusting; Super Sweet seed needs to absorb twice as much water to germinate as normal corn; Super Sweets are more particular about seed depth (they do better at a shallower depth); Super Sweets have twice as much sugar as other corn and get sweeter after picking. It can get too much, so refrigerate promptly after harvest. New fancy types are often more risky. They don’t have all the problems resolved. Romanesco Broccoli – I don’t know anyone in Virginia who has successfully grown it. Flower Sprouts – hmmm. Try brand new things on a small scale first. All the fanfare over Indigo Rose tomato, the excitingly evil Deadly Nightshade color of the immature fruit, and then – blah flavor when ripe. “Good” flavor in a catalog may be the lowest rating. “Attractive purple pods” – Do they turn green when cooked? Purple carrots, striped green and white eggplant, white beets – will people buy them readily or will it be an uphill struggle?